Polluted semi-salty water with pearl river sediments & from electricity plant. ...... wind usually picks up in sunny afternoon, blow steady til dusk, only work in hot summer, 10 - 15 knot. Good when southwest monsoon wind hit. Sandy base with sharp objects ( shell, rocks... wear booties), shallow water when mid tide. Trees and road 10m from water edge. Beware of heavy traffic when go further out of the bay. 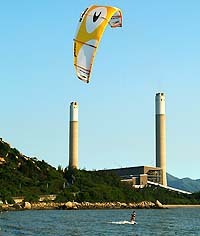 Windsurfing centre provides rescue service, ask in advance and kite with your cellphone. From HK Island , take bus 962 in Causeway Bay, Wan Chai or Central to Tuen Mun about 50min. Then hire green taxi or catch bus no. K52 to Lung Kwu Tan.